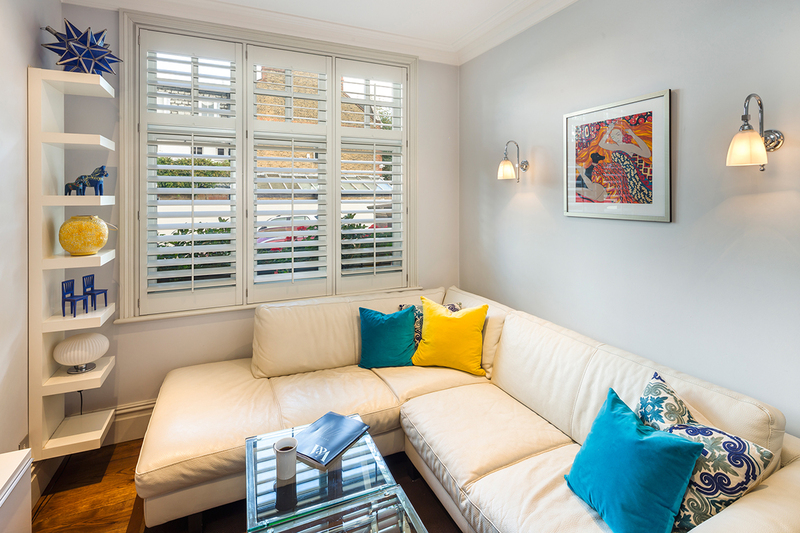 For our latest installation, we got to sit down with the wonderful Anneli and speak to her about her home in Barnes and our finest quality shutters that we fitted, adding style and comfort to her home. Anneli is originally from Sweden but has been living in London for many years with her family. She chose our premium White Teak Shutters to compliment her home and loved how they fit in perfectly with her interior style. We fitted our shutters in a selection of rooms in her house, including the Master Bedroom, T.V room, Study, and her daughter’s bedroom. Question 1: Describe your interior style? I feel my interior style is very Country Modern. I love the bold mismatched effect that my house has and had fun creating it. I think a good country house radiates tradition and comfort. I enjoy combining texture and materials when creating a homestyle, and I feel my home encapsulates my love for texture and variety. My style combines my Swedish inheritance with my lifestyle in the UK. Question 2: What motivated you to choose shutters within your home? I love the beautiful light that comes through the shutters during the day. Shutters also provide privacy as well as being able to look out (perfect as my home is located in the busy bustling Barnes). I love the look of shutters, it reminds me of being on holiday in hot sunny countries. And the fact that they are very easy to clean is a huge bonus. Question 3: Your property is beautiful, tell us what differentiates your property from others in this area of London? I feel my property has a unique style, I have built and developed my style from my experiences and interests. My home is a combination of memories that highlight my family’s life experiences. When I moved over to London I admired the exposed red brick buildings and wanted my own home to have this feature, topped off with my flower bed for botanical personality. Question 4: What’s the best thing about living where you do? The best thing about living in Barnes is that it has a lovely village feel, whilst at the same time being very close to central London. I enjoy having the access to all the parks and walks nearby. Question 5: What difference (s) have you noticed in your home since shutters have been installed? They have assisted in developing my interior style. Complimented and praised the character within my property. Shutters have definitely transformed my windows and heightened my style. We’re always more than delighted to hear that a customer of ours is happy with our services and how our shutters have made a difference to them and their home. You can find many more loving testimonials, just like this one, over on our Customer Reviews page. Plantation shutters are the perfect choice for any busy family as they are durable, easy to maintain, offer privacy, light control and of course are very stylish! For all your plantation shutter queries please call us now on 020 8871 9222 or email our friendly team today.